We carry ultrasound probes for all types of machines including GE Ultrasound Equipment, Phillips, HP, and more! 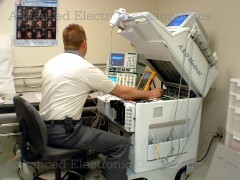 For 26 years Advanced Electronic Diagnostics has offered a wide variety of new and like new refurbished Ultrasound Imaging systems. We sell, service, and support all major brands including, Acuson, ATL, Biosound, GE, HP, Interspect, Midray, Philips, Siemens, Sonosite, Toshiba, etc., and specialize in systems configured specifically to your needs, present and future, and they all come with a full no-hassle total care warranty. Our inventory is constantly changing so please feel free to contact us. Even if we don’t have the system you are looking for, we will get it, refurbish it, and have it in your place in 10 days or less and still give you the best price in the industry. We also carry a wide variety of accessories also at great savings, such as refurb and demo medical DVD recorders, Sony and Mitsubishi Printers, Dicom servers, Transducers etc., all at prices well below OEM. We’ll never hit you with a high pressure sales pitch, and will never attept to get you to buy something you don’t need, unlike some of our competitors! Call or e-mail today to see what a small dedicated family owned comapany has to offer. Ask for me, the main cheese, the senior engineer, the ultrasound specialist, and you will not want to buy anywhere else because 100% customer satisfaction is always my goal. We have a constant inventory of different machines at different locations, call us today for your special requirements!